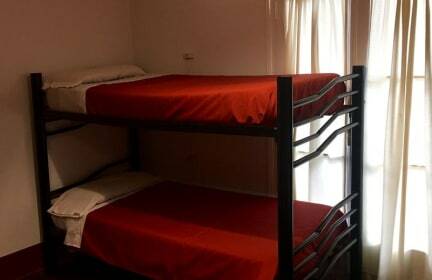 We are a small hostel hosted by owners and an outstanding staff that gives the best to help you achieve an excellent stay in Mendoza, with the maximum quality of possible attention , a comfortable stay, safe and clean experience. 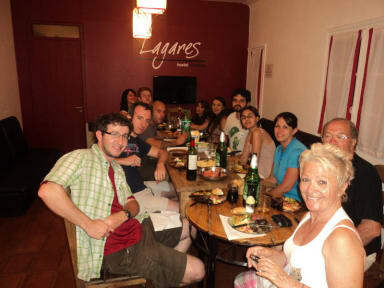 If you are looking a chill and relaxing place to rest, to get to know travelers like you, Hostel Lagares is your best option in Mendoza. You can enjoy the city to the maximum and be surprised with many tours and adventure activities, including the wineries and mountains. Our property is a charming place where you can chat comfortably, enjoy a movie with friends in the living room, or prepare a typical argentinian bbq on the terrace with a glass of wine. We are located in the historic centre of the city, two blocks from the main avenue San Martin. There you can find the wide path Alameda surrounded by large trees , flower sellers , little bars and restaurants that give it a special atmosphere. In our neighbourhood you can find many shops close by such as supermarkets, banks , and money exchange, all in your hands. Homemade buffet breakfast with coffee, milk , juice , tea , homemade bread ,scrambled eggs, cereals, two differents flavors of delicious homemade jam , butter and homemade cake. We provide maid service , air conditioning and heaters in all the rooms, terrace with tables, chairs, and a grill to bbq when you want . We have a dvd collection with more than 1000 movies available!!! !, Free internet and wi fi ultra speed. We have wines , beers , and cold drinks for sale . We have of course the best attention and touristic recommendations . * Any rooms that have been pre-booked must be cancelled before 12 noon the day before otherwise you have to pay the full balance. * Check in at 12pm / Check out at 10am . * The Double Bed private consists of together twin beds.